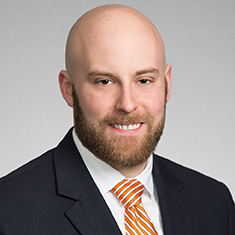 Ethan Post focuses his practice on a broad range of corporate and securities matters, particularly in representing buy-side and sell-side clients in private M&A transactions. He also provides counsel on corporate governance, private equity issuances, financing transactions and other general corporate matters across a variety of industries, including technology, health care and private equity. In 2015, Ethan successfully completed the Fullbridge Program. While in law school, he served on the editorial board of the Virginia Journal of Law and Politics. Shown below is a selection of Ethan’s engagements. Representation of a Nasdaq-listed commercial bank in a follow-on equity offering of 448,500 shares and a secondary sale of 1,899,959 shares, having an aggregate offering price of $150 million. Representation of the seller of water & wastewater treatment assets. Representation of a real estate developer and service provider in the establishment of a $50 million credit facility secured by single-family properties and the repayment of an existing loan. Representation of a global financial technology company in its acquisition of a leading provider of gift card commerce. Representation of a Dow 30 company in the amendment and extension of a $7.5 billion 364-day credit facility, a $5 billion five-year credit facility and a $1.75 billion letter of credit facility. Representation of a leading, worldwide retailer in connection with its offer and sale of ¥70 billion aggregate principal amount of its 0.183% notes due 2022, ¥40 billion aggregate principal amount of its 0.298% notes due 2024, and ¥60 billion aggregate principal amount of its 0.520% notes due 2027 in an SEC-registered, underwritten offering. Representation of a Dow 30 company in connection with its cash tender offer of $5.5 billion aggregate principal amount of its notes in an SEC-registered, underwritten offering. Representation of various private equity funds and certain of their portfolio companies in connection with acquisitions, “add-on” and exit transactions in various industries. Representation of a specialty chemical company in the sale of one of its production facilities and related assets. Representation of a group of urgent care centers in their sale to a national urgent care network, including extensive pre-closing reorganization of the selling group. Representation of private companies in significant equity capital raises across various industry sectors, including financial services technology, cloud computing and medical technology. Representation of a public real estate company’s largest stockholder in a proxy contest seeking board representation and a commitment to pursue a sale of the company. Representation of a dairy processor in an equity recapitalization in which an international private equity investment firm became an equity holder.